Though these fuel-burning appliances and vehicles produce CO, when well-maintained and used properly, the amount is non-hazardous. It’s when things malfunction (or are used incorrectly) that they can turn deadly. And every year, hundreds of people in the United States die from accidental CO poisoning. For more information about the symptoms of CO poisoning, click here. How can you protect your home or office from too much CO? Install a CO alarm or a CO detector. The CO alarm is a stand-alone unit which has its own built-in power supply and audible device while the detector is designed to be used along with your fire alarm system, drawing its power from the alarm panel. 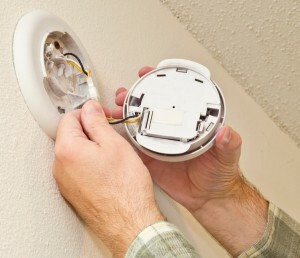 If your CO detector is battery-operated, test it regularly (once a month is best) and replace the battery once a year. If installing a CO device yourself, be sure to consult the manufacturer’s recommendations in the installation guide on where to place it. CO alarms aren’t intended – or suitable – for fire and smoke detection. Denalect customers can save money by coordinating their annual alarm inspection with a CO detection assessment. If you wish to learn more about protecting your home from CO, feel free to contact our business office at (925) 932-2211. Business hours are 9am to 5pm, Monday through Friday.